Energy-saving humidifiers with pneumatic spray nozzles producing Dry Fog**. With world-leading technology, our AKIMist® “E” produces ultra-fine “non-wetting” Dry Fog, which doesn’t wet the objects it touches. Prevents dryness and static electricity, enabling higher manufactured product quality and lower defect rates. The running cost is one-fifth of a comparable steam humidification system. For spaying chemical solution, chemical-resistant AKIMist® “E” TN is available. *1) Spray volume per one AKIMist® “E” with nozzle type 03C. It varies by the nozzle type. *2) Sauter mean droplet diameter of AKIMist® “E” with nozzle type 03C. It varies by the nozzle type. 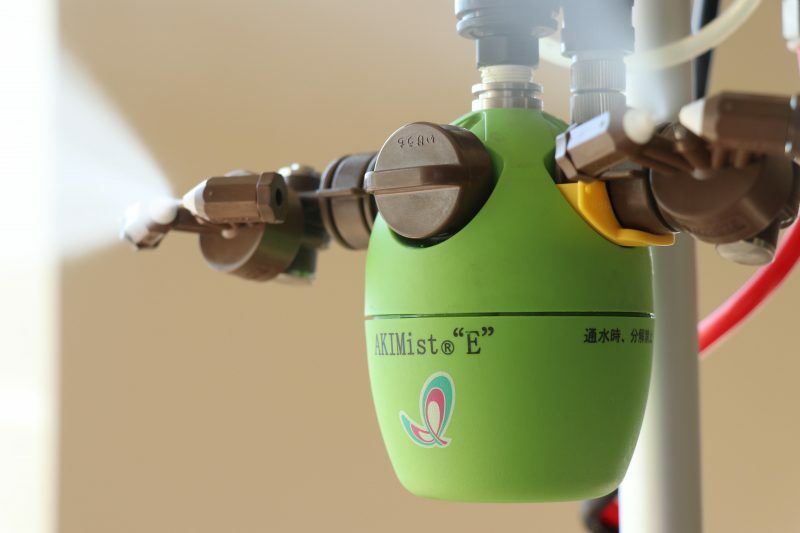 *3) Air consumption of AKIMist® “E” with nozzle type 03C and 03B. It varies by the nozzle type. Because Dry Fog’s exceedingly fine spray droplets remain intact without bursting when they come into contact with objects such as walls and people, they do not wet these impact surfaces. “Dry mist,” despite its similar name, has much larger droplets than Dry Fog and has no specified droplet diameter as part of its definition. Dry mist droplet sizes vary significantly by producer and product. Preventing electrostatic discharge damage during assembly, mounting/installation and tests; preventing debris and dust adhesion; mitigating rises in incorrect-chucking rates; preventing mounting errors. The AKIMist Dry Fog humidifier is recognized as a requirements for soldered electrical and electronic assemblies based on IPC J-STD-001 standard. Rotogravure printing: Preventing ink pan and ink roll fires, preventing debris and dust adhesion to films and papers, dust suppression, reducing ink striation from doctor and/or plate cylinder, preventing adhesion of debris caused by ink’s electrostatic charge. Screen printing: Preventing print defects caused by feathering, misregistration, streaks, blurring, etc. ; preventing fading caused by plate dryness; productivity improvements. Offset printing: Controlling moisture content of paper; preventing paper break (web break), jams, and misalignment; reducing paper tearing; improving folding precision; preventing color drift; preventing curl. Others: Form printing, humidification for cardboard production. Preventing dust and debris adhesion in the body and bumper coating, inspection processes; dust suppression in storage rooms; static charge prevention in vehicle electrical components production and circuit board mounting process; heatstroke countermeasures; shortening cycle times. Reducing work efficiency declines caused by static electric shock, preventing fires, preventing scattering of debris and body hair, preventing adhesion of debris, preventing toppling of stacked items caused by static electricity. Preventing debris adhesion in painting/coating process; cissing prevention; preventing fires during paint/coating preparation processes, in areas around reaction tanks and mixers, and during filling processes for substances such as pigments and coatings. Maintaining optimal humidity level in plant factory, greenhouse, and storage warehouse; humidification for mushroom nurseries; disinfection. Humidification and dust suppression in machine parts production, textile industry, agriculture, livestock and warehouses, etc. Do you want to order this product? Or request a quote?